We all need space; unless we have it we cannot reach that sense of quiet in which whispers of better things come to us gently [and we need] places to sit in, places to play in, places to stroll in, and places to spend a day in. above is a photo of "i, goat" by kenny hunter - 2010 winner of the spitalfields sculpture prize. 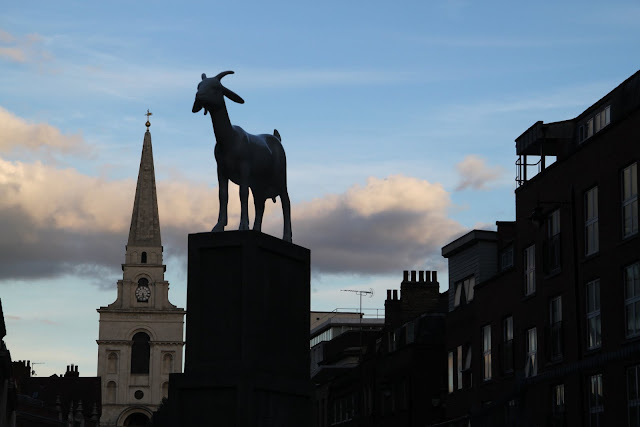 hunter's goat is located in the spitalfield market neighborhood of london; the work, a hand sculpted goat which sits atop a stack of packing crates was inspired by the community's rich and diverse social history. at the unveiling of the work in january 2011, hunter stated that "Goats are associated with non-conformity and being independently-minded. That is also true of London, its people and never more so than in Spitalfields." led zepplin's ramble on which is on their 1969 album led zeppelin II - written by jimmy page and robert plant, the song is included in rolling stones list of the 500 greatest songs of all time. Spitalfields was also the hunting grounds of Jack the Ripper and was considered the worst slum in London at the time. I hope they've cleaned up the neighborhood with more than just sculpture. ah roy you know your london! if it was once the worst slum in london, it is no longer. the area is quite lovely. thank goodness its not completely gentrified but it does seem pretty much so. coincidentally my nephew did take us to a bar across from the famous christ church which is reputably said to have been some sort of ripper hunting ground. spitalfields is quite close to brick lane, which was how we happened to wander into the area as we went to brick lane for the food and to check out some street art. Interesting post about Spitalfields, which I knew nothing at all about. Well, we have a goat, and I can attest to those attributes. We've also been known to say that the goat is smarter than humans. You can fool her once. That's it.